Illinois Hardy Pecan - Carya illinoiensis - Native to the southern US and parts of the midwest. 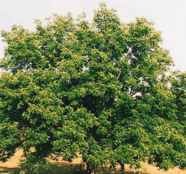 Trees are of medium height and produce edible nuts, which are of excellent quality and prized by people and wildlife alike. The nut shells are a bit thicker than the Southern papershell pecans, but are not as thick as those of the hickory, the hardy pecan's cousin. The taste is nearly identical to papershells. The tree bark is used to produce an astringent. The plants are fairly tolerant of soil types, but prefer a well-drained sandy loam. The trees make excellent shade or forest trees and are long-lived. A single tree will produce nuts. Begins bearing in 12-15yrs. Hardy to -20F (-28.8C); height: 50ft. Stuart Hardy Pecan - Carya illinoiensis 'Stuart' - Hardy variety developed for the northern US, with nuts that are a bit smaller than the southern pecan, but just as tasty and sweet. Shells are thinner than the species. A single tree will produce nuts. Approximately 5 years to fruit. Hardy to -30F (-34.4C); height: 30ft. involves breaking or weakening the seed coat with a file or sandpaper. Following the scarification, the seeds should be dull in appearance, but not deeply pitted or cracked which may damage the embryo. Once scarified, seeds will not store well and should be planted as soon as possible after treatment. This treatment works well for larger seeds. Smaller to medium seeds may be rubbed between sheets of sandpaper. The smallest seeds should be scarified by HOT WATER, ACID, or NATURAL methods.